Did Jesus Call that Poor Woman a Dog? Learn more this Sunday: The Hard Sayings of Jesus. It takes quite a bit of time, internet-wise, to upload a sermon. I noticed that we are very far behind in this task, and hope to upload the rest of the Ephesians series, and the sermons for the rest of 2015. This might be a good place to put in a plug for a volunteer: If you live in the Hamilton, Ontario area, we could use a sound engineer to help with the recording and uploading of sermons. By “helping,” I mean, “doing basically the whole thing.” As it stand right now, I record my sermons on my smartphone, then transfer them to the computer, and rename them for uploading. Then upload them. So, the first two sermons in the “Hard Sayings of Jesus” series are now up. Just click here. And if you’ve been clamouring for the sermons, I apologise, and thank you for your patience. If you haven’t exactly been clamouring, but just wondering, now you know: the uploads have been put on the back burner. Scott Jacobsen, Minister, Mountain View Christian Church. 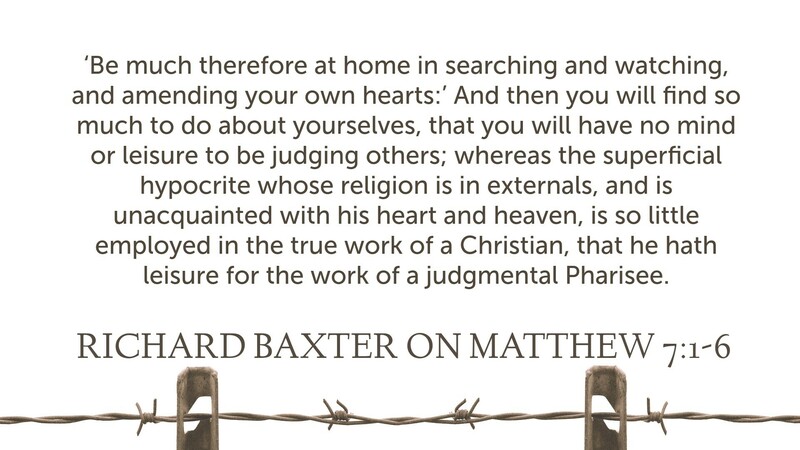 ‘Be much therefore at home in searching and watching, and amending your own hearts:’ And then you will find so much to do about yourselves, that you will have no mind or leisure to be censuring others; whereas the superficial hypocrite whose religion is in externals, and is unacquainted with his heart and heaven, is so little employed in the true work of a Christian, that he hath leisure for the work of a censorious Pharisee. Richard Baxter, William Orme, The Practical Works of the Rev. 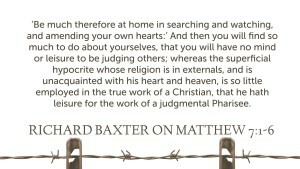 Richard Baxter, vol. 6 (London: James Duncan, 1830), 403.